This project is a result of what happens when a creative person relocates, packs away all their possessions in storage and moves to the beach (temporarily) while house hunting. 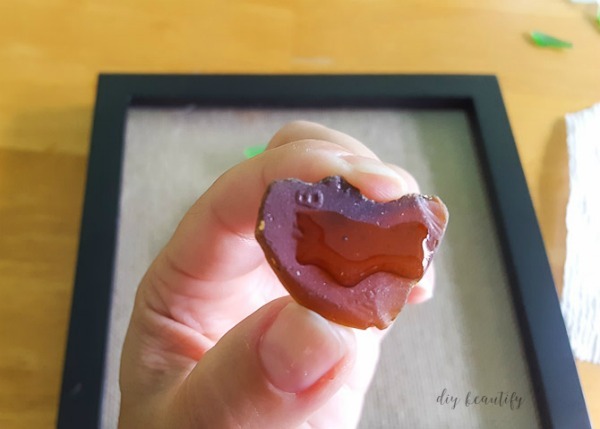 I found a way to create fall, even at the beach and am excited to share this DIY beach glass pumpkin with you today! 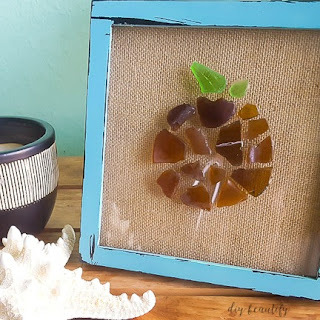 If you love this project but don't live near a beach, no worries...you can purchase beach glass at craft stores and online! Sometimes creativity cannot be contained! 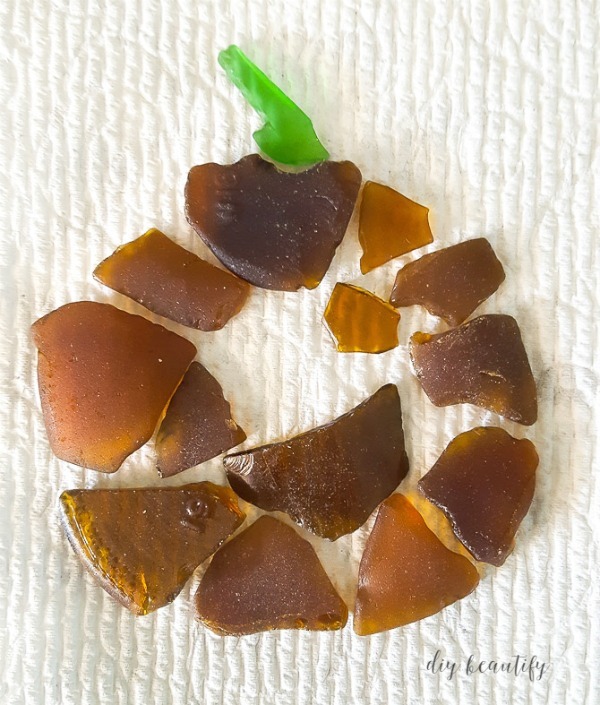 As we've been enjoying our temporary stay at the beach, I've been collecting beach glass. I had no real intention to do anything terribly creative with it (other than display it)...when tropical storm Hermine started playing havoc with the tides. Low tide just kinda disappeared...for days...and my beach-combing for white, blue and green beach glass yielded nothing...nada. 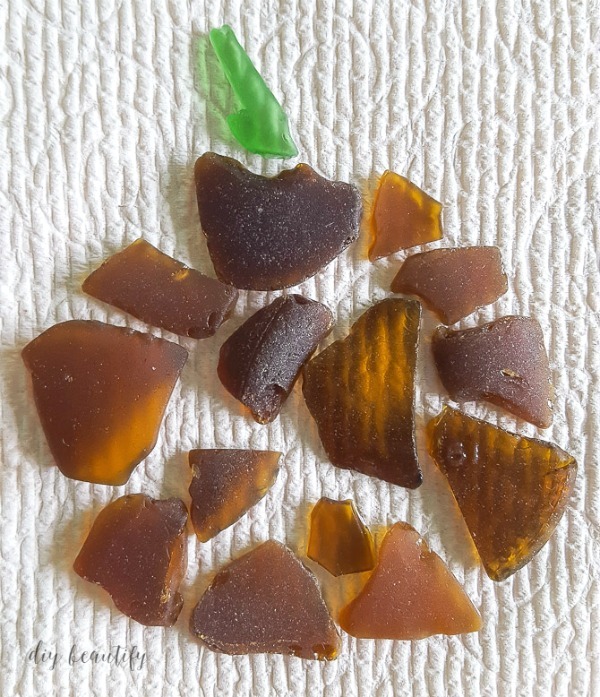 What I did find, interestingly, were a select few pieces of brown beach glass...a color I had previously snubbed and not planned on collecting. But when you're desperate for a project, you start to see items with new eyes! I played around with the placement of the glass and saw a little pumpkin start to take shape! Of course, then my beach-combing efforts doubled as I needed to find that one last piece! Affiliate links are provided for your convenience. Find my full disclosure policy here. Take the frame apart. Trace the inside mat onto a piece of burlap paper (or other specialty paper you want for your background) and cut out. Glue the burlap to the backboard piece. I didn't use the mat at all...save it for another project! 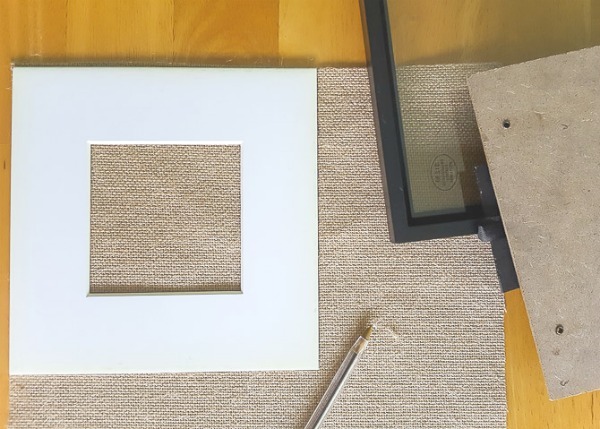 Trim burlap paper to fit and replace backing into frame. Glue the pumpkin shape to the front of the glass. I found that last piece of brown beach glass, and had to rearrange my pieces a little to make it work. 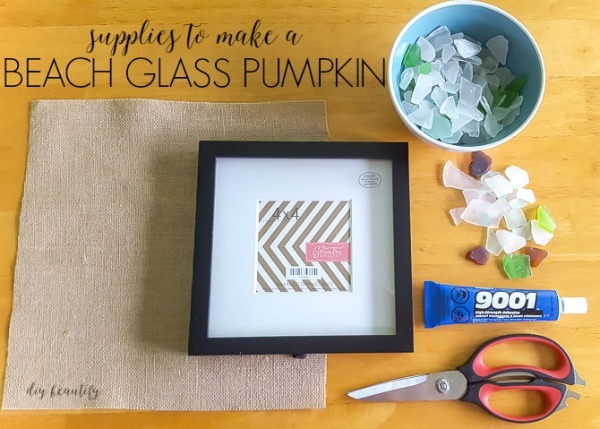 Glue the top piece first, then move your way around the pumpkin shape, adding the beach glass carefully to make sure placement is right. 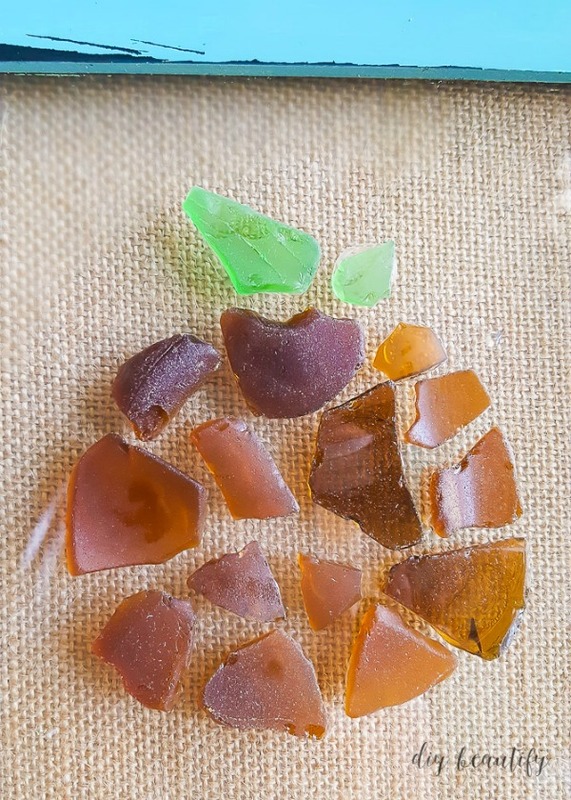 My favorite thing about beach/sea glass is that no two pieces are alike! Different shapes, and varying lengths of time getting tossed and tumbled in the salt water means that each piece is unique...but they're all beautiful! I ended up using a larger piece of green beach glass for the stem, as well as a small leaf shape. At the last minute I decided to paint my frame bright turquoise! The black frame was just too dark. All my chalk paint is sitting in a box in the beach house, so I grabbed a brush and got to work. Two coats of paint later, a little distressing with a sanding sponge brought out the black of the frame and my little beach glass pumpkin was finished! 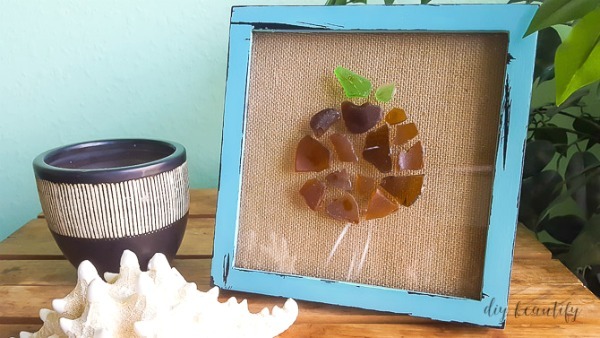 This beach glass pumpkin turned out so cute, don't you think? 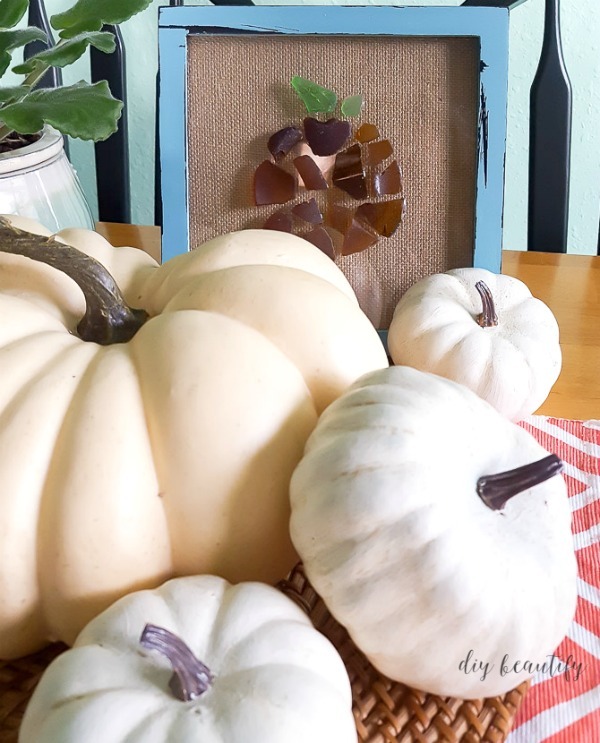 I'm loving it displayed with these heirloom-painted pumpkins that I'll be sharing next week! If you enjoyed this project, PIN IT HERE so you don't forget about it! 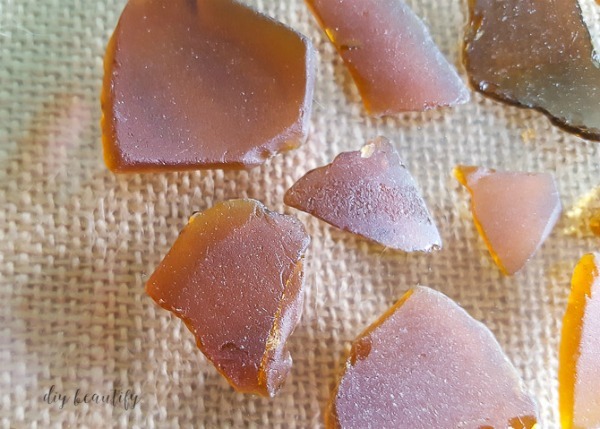 Even though we'll be settled into our new home by Christmas and no longer at the beach, I have some ideas percolating for a Christmas project using beach glass and seashells!